It seems like just yesterday that the Downtown Denver Rink opened its doors to the public, but the season is nearly over now with less than a month’s worth of fresh ice left to enjoy. This local hotspot is nearby the off campus housing at CU Denver, making it worth one more skating session before the season comes to a close. Here’s what you need to know before you go. Now in its 9th season, the Downtown Denver Rink provides free ice-skating sessions to the public seven days a week. So, you can head over anytime your schedule allows. The rink stays open until February 3rd this year. While that’s less than a month away, the ability to skate any day of the week provides plenty of opportunities. Monday through Thursday: 12 p.m. to 5 p.m.
Martin Luther King Jr. Day: 11 a.m. to 6 p.m. Your skate session is entirely free if you bring your own pair of skates, but you will have to rent a pair otherwise. Luckily, the cost of rentals is incredibly cheap. Adults 13 and older are charged $8 per rental with rentals for children 12 and under costing only $6. If you plan to do a lot of skating, then you might want to weigh the cost of rentals to the price of a season pass. For any adult (12 and up) a season pass costs $50. If you plan on skating more than 6 times, it makes sense to save money by purchasing the pass. There is also a glow-in-the-dark silent disco on Saturday, January 5th. The event lasts from 4 to 7 p.m. and is hosted by SoundDown Party, a local business in Denver. Expect light shows, LED performers, and a ton of unique displays while you sip on hot cocoa or skate. You can book a private event at the Downtown Denver Ice Rink for you and your friends, giving you exclusive access. All private parties and events are held outside of normal business hours, which means you’ll be skating under the lights at night. The rink provides music, too. You will need to bring your own food and drinks to the party, but keep in mind that alcohol is not allowed. The cost to book an event is $500 per hour with a $250 deposit due at the time of booking. That includes skate rentals for the first 25 guests. As always, there are a number of questions people ask about the rink. Here are answers to a few of the most frequent according to the rink’s website page on Downtown Denver Partnership. The rink tries to stay open as often as possible. In the event of heavy snow, they may need to delay opening to clean off the rink. If conditions are unsafe, it will be shut down. You can call 303-825-6787 for weather and delay updates. There are three parking garages nearby on Lawrence Street. You can choose from Writer’s Square, the Tabor Center, or 1515 Arapahoe Building. 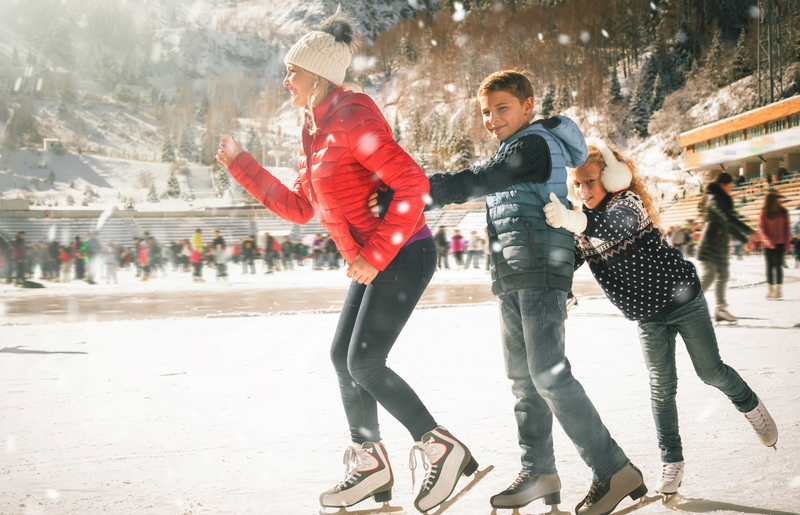 Double-bladed children’s skates run from size 8 to 13. Singe bladed child’s skates go from size 9 to 13. Junior skates range from 1 to 4. Adult skates range in size from 5 to 14. Skating lessons are offered, just in case you want to hone your skills or need a little refresher. Lockers are available to hold your items while you skate, but you will need a valid ID to rent one. You’re allowed to bring food and drinks, just nothing alcoholic. A brand-new campus-adjacent urban basecamp, COLAB is thoroughly equipped to satisfy everyday needs while fueling your endless mountain spirit. Modern conveniences, luxury amenities, and a premier location combine to create a new level of living upping the game on student apartments. Each home within COLAB features smart and stylish furnished interiors. Dedicated bedrooms incorporate full-size beds with built-in storage, study desks, and private bathrooms. Kitchens in each unite feature quartz countertops with tile backsplash and modern cabinetry. G2B high speed internet and 55” smart TVs are included, as are full-size washers and dryers to make living a little easier. Plus, you utilities are all-inclusive. The community at COLAB is filled to the brim with carefully curated amenities designed to cater to every facet of life. Residents can tackle projects in the conference or tech rooms, stay active in the fitness and yoga centers, or relax on the roof deck after a long day. Mingle in the outdoor lounge and water court with table games or catch a movie in the screening room. Pet friendly with roommate matching and onsite parking, everything you need is right here. Right in the heart of downtown Denver, your premier location at COLAB places you blocks away from CCD, MSU, and CU. Exquisite shopping, decadent dining, and nightlife opportunities are moments away from your front door. Plus, you can escape it all with a trip to the mountains anytime you desire. With Denver’s ample public transportation, you’re a mere 0.2 miles from the closest light rail station, Colfax, and 0.1 miles away from the nearest bus stop. The bulk of Denver is at your fingertips whenever you need it. Naturally urban and filled with “pawsitive” vibes (it’s pet friendly), these luxe student apartments allow you to make every day awesome. Live big. Live true. Live COLAB.